The video-game, "Fallout 76," when it was first announced, intrigued me a bit. A spin-off of sorts from the usual games, developed by Bethesda (who have made a chunk of the more recent, "Fallout," titles), and with some cool hooks. 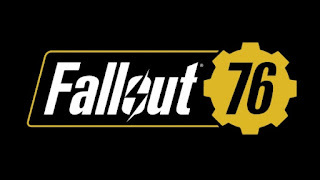 Set in West Virginia (where I've previously lived, so that's cool) before any other, "Fallout," game and focused on when some of the first, "Vaults," opened and people attempted to make the land suitable for human life again, it was a prequel to everything else, basically. That was maybe neat. It would also be online, but in a way where you had servers with some other players but not some kind of massive big server so much as little instanced ones. That sounded a little odd. Then it was revealed there would be no human computer characters, only real-life players would be humans and everything else would be a robot, ghoul, animal, etc. with the only hints of actual humans being old in-game computer files, audio-tapes, etc. which is a bizarre idea to me, someone whose best memories of, "Fallout," games came from the zany folk I would encounter--even if they weren't, "Real," so much as carefully-scripted NPCS. I thought the game would perhaps be decent, however. From what I've heard though, things ain't good. Reviews of, "Fallout 76," seem to range from thinking it has potential to outright declaring it a buggy monstrosity. For a multiplayer game it sounds awfully lonely, with most people just avoiding each other to accomplish little quests or build-up a camp, the game apparently is disgustingly buggy and crashes so often it is comical. Also, people who bought the game with an expensive collector's edition are mad that a nice tote they were promised turned out to be the equivalent of a plastic trash bag--but Bethesda is slowly sending out replacements now that a supposed, "Shortage," of the material for the bags has ended. Oh, and if you want to report a problem with the many bugs in the game or ask for your nicer bag, be wary as a glitch in Betheda's own system had people getting other individuals requests for support, and being able to see all their personal information. To say the launch of, "Fallout 76," hasn't exactly gone smoothly would be an understatement as flimsy as the initial collector's edition bag. Maybe eventually a workable and fun game will emerge as, "Fallout 76," gets extensive patches and updates. For now though, it is as messy and ruined as the post-nuclear wasteland it portrays.